Last year wasn’t great for anyone who has a fear of clowns thanks to the hugely popular cinematic adaptation of Stephen King’s It. And now 2018 isn’t looking any better for those who suffer with coulrophobia as a new film called Terrifier is being released. Promising to leave you hiding behind your sofa, Terrifier follows the story of the seriously unhinged Art the Clown who terrorises three young women on Halloween butchering anyone who gets in his way. Directed by Damien Leone, the movie is based on his 2008 short film of the same name which featured in his anthology series All Hallow’s Eve. 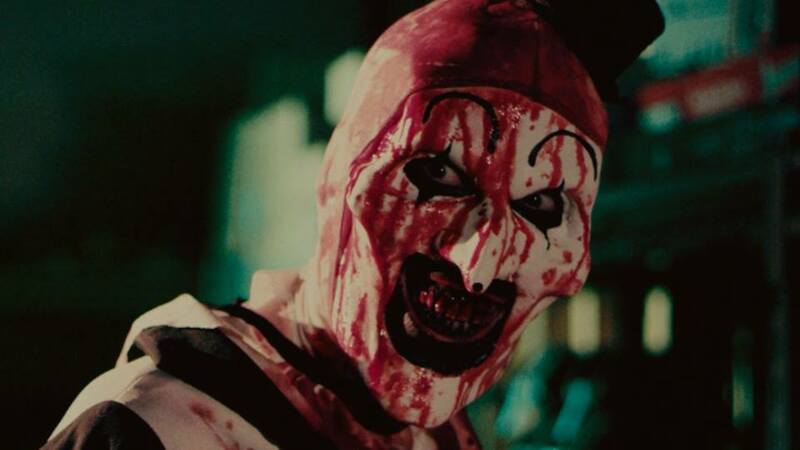 With Terrifier first premiering at the Telluride Horror Show Film Festival in 2016, it has taken a while for the film to reach the rest of the public but from April 9 it will be available on digital download and DVD. It’s longer, scarier, sicker, bloodier and has more victims. I did try my best to keep the feature as close to the short as possible in terms of simplicity and tone. The short was brutal and intense and once the action started, it didn’t let up. If I could cut out as much filler as possible and make the entire feature feel like the last 20 minutes of most slasher films, then I felt we’d be on the right track. The idea of Art the Clown first came to Leone over a decade ago in 2006, two years before he made the short film. One day, this idea just popped into my head about a young woman being harassed on a city bus in the middle of the night by this psychopathic clown. His antics slowly go from playful to threatening until he’s eventually trying to stick her with a needle. What could be more nightmarish? This essentially became the opening of my short film The 9th Circle which was the first introduction to Art. The creepy clown has since become a cult figure in the world of b-movie horror but we still do not know much about his origins. You will certainly be given some clues as to who or what Art is, but whether or not you’re given the whole story is for the audience to find out. Personally, I like the fact that fans are pretty much split down the middle when it comes to his origin. Some really love the ambiguity and feel that not knowing adds to the creep factor, whereas others feel that not disclosing that information is a total cop-out and due to a lack of imagination. I tend to agree with both parties, but a character without a backstory can only go on for so long before you are, in fact, cheating the audience, in my opinion. We will find out just how much of Art’s history is revealed when the film is released on April 9.